We love squirrels! Who knew there was a National Squirrel Appreciation Day? We did not. According to National Day Calendar, Squirrel Appreciation Day is observed annually on January 21. The creator of this holiday, Christy Hargrove, is a wildlife rehabilitator in North Carolina, and is affiliated with the Western North Carolina Nature Center. According to Christy, “celebration of the event itself is up to the individual, or group. Anything from putting out extra food for the squirrels to learning something new about the species.” Here in Colorado, mom and the Colorado Traveling Ducks, put bread on our patio when the ground is covered with snow. This squirrel is on his feeder in my front yard. 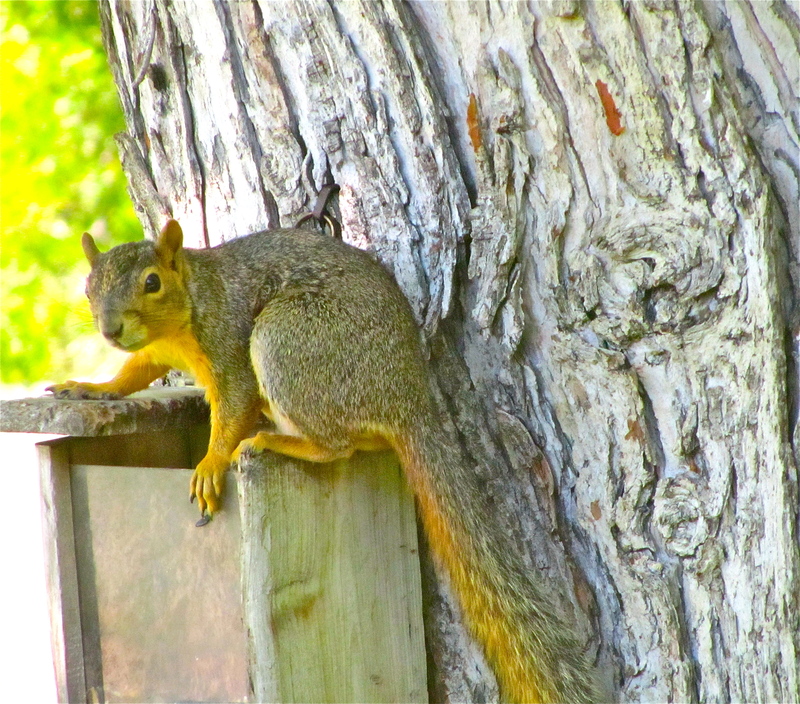 A squirrel on his feeder in my yard. But I, Zeb the Duck, love watching the squirrels, and birds, come to the patio and eat bread. This entry was posted in Holidays, Uncategorized and tagged Colorado Traveling Ducks, National Squirrel Appreciation Day. Bookmark the permalink. Because we don’t have them in Australia, we always enjoy seeing squirrels when we travel. They’re pretty cute. We love watching the squirrels in our yard. However, they can be destructive and some humans don’t like them. We and our humans really like the squirrels. Thanks for reading and commenting. If you like squirrels, then you’ll you’ll like this little time lapse i posted on my facebook. Spread out some nuts and one of them came and it’s really cute. Thanks. I will look at it. We think they are cute also.